Electro Harmonix Tone Tattoo is fully analog and combines three of the most popular guitar effects: distortion, chorus and delay, into one small and convenient package. The first true multi-effect from Electro Harmonix. Each section in the Tone Tattoo is taken directly from some of Electro Harmonix's greatest effects: Metal Muff for distortion, Neo Clone for analog chorus and analog delay from the Memory Toy. 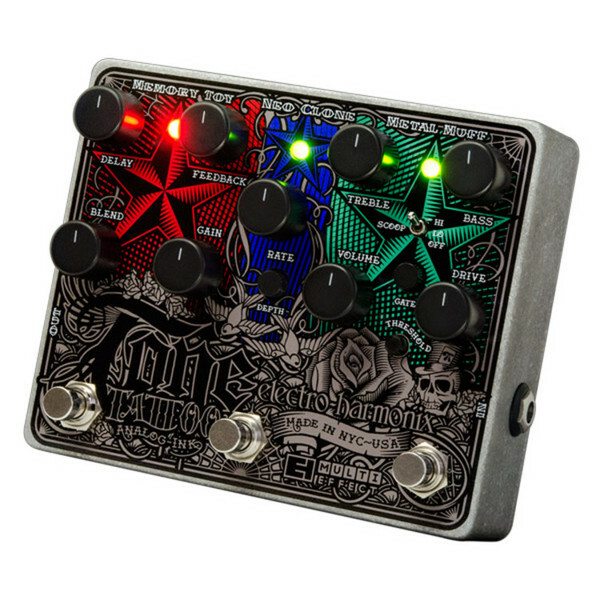 The effects in the Tone Tattoo are completely independent from each other. Three separate footswitches, one for each section, allow for individual control over which effect is on or off. Each effect has its own dedicated knobs and switches all of which are tweakable at any moment; there are no menus to scroll through or dual function knobs. Using the Tone Tattoo is like having three separate effects pedals on your pedalboard but without the need for the additional cables or separate power supplies and all in the footprint of one medium sized pedal. For further information about the Electro Harmonics Tone Tattoo, please download the instructional PDF file from the link below.